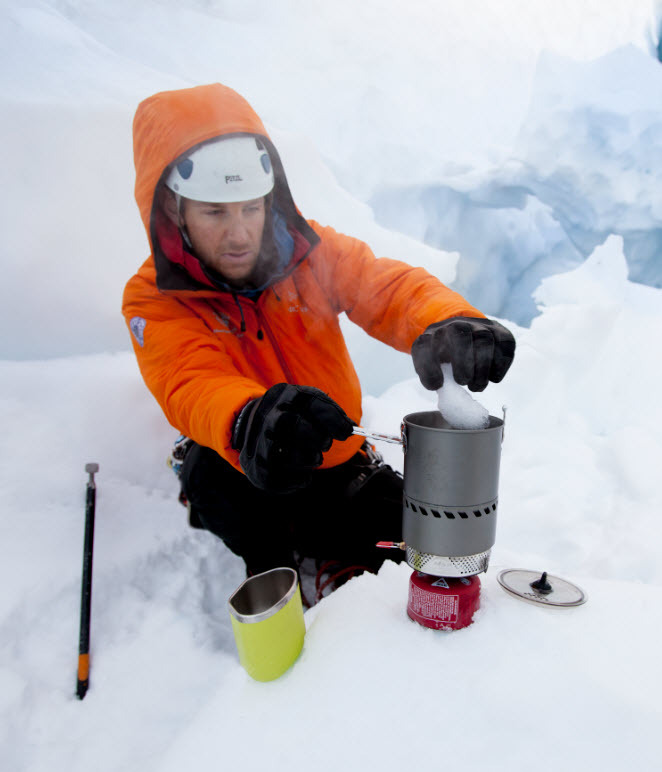 MSR engineered the Reactor and WindBurner stove systems to be the fastest, most fuel-efficient stove systems in the real-world conditions of the alpine. Achieving such a high performance standard required a stove that goes beyond the conventions of camp stove burner technology. Based on decades of research and more than five years of development, the MSR engineering team built the Reactor, and then the WindBurner, around a unique radiant burner head. The Reactor was the first climbing and backpacking stove to truly harness the benefits of a radiant burner. Radiant burners allow canister fuel stoves to achieve high-performance, excellent efficiency and great weather resistance. What is a radiant burner? Radiant burners use a porous material to mix fuel and house the flame. The resulting burner produces both convective and radiant heat. These burners can be made from a variety of porous materials, including wire mesh and ceramics. The Reactor uses a porous disc made of an alloy called Fecralloy to create a burner that is lighter and more durable than those made of other materials. The process used to create this material is complex and requires precise manufacturing control. Open-cell foam is impregnated with a slurry of Fecralloy alloy and the conglomerate is allowed to solidify. The material is then baked at a temperature that causes the open-cell foam to dissolve. What remains is a rigid alloy structure that looks much like open-cell foam. This material is cut into discs that become Reactor burners. When the Reactor is operating, gas travels from the canister, through a pressure regulator, to two jets that inject the fuel into a cavity under the porous disc. Here, the fuel mixes with air and flows through the pores in the disc. Ignition occurs in the upper level and at the surface of the disc. 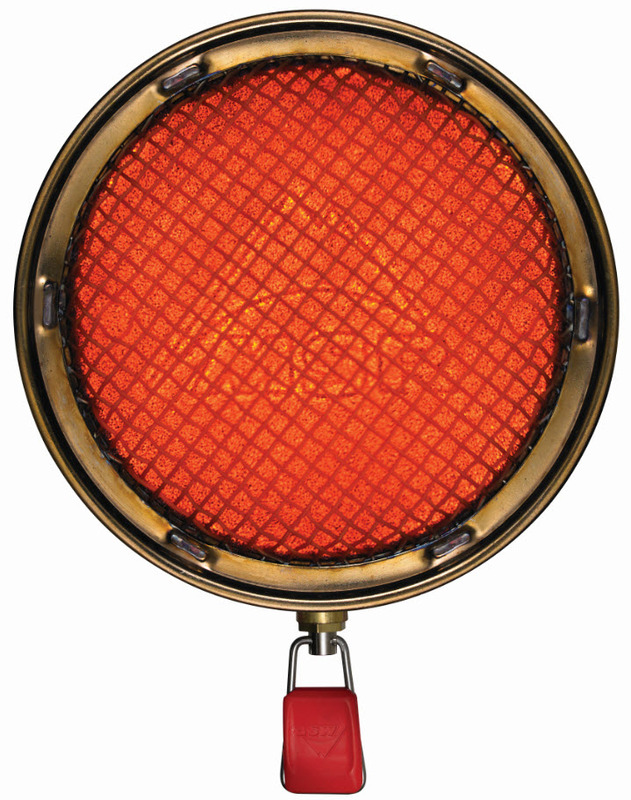 The flame spreads evenly over the disc, creating broad, consistent heating. Flame temperatures reach 3600 degrees Fahrenheit and the protective mesh above the disc reaches 1600 F.
The Reactor requires a heat exchanger to effectively harness the power of the radiant burner; this heat exchanger is built into all Reactor cookware. The large surface area of the heat exchanger allows efficient transfer of both convective heat and radiant light energy from the burner. What is radiant light energy? 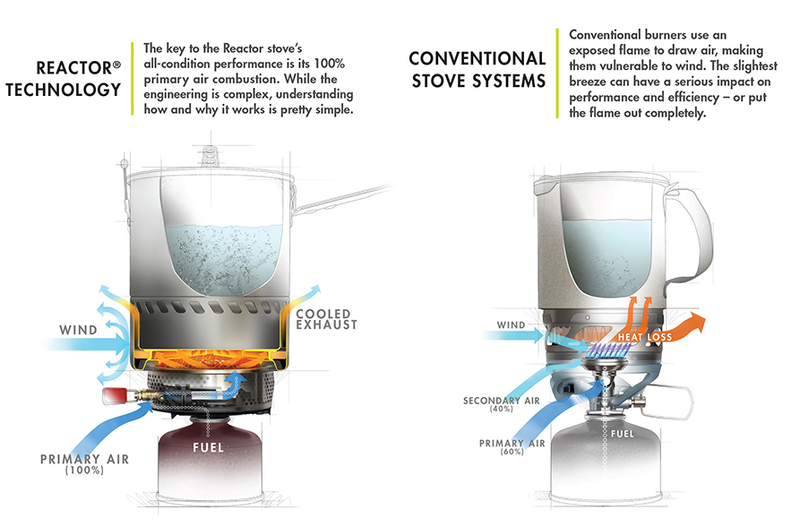 Conventional stoves produce convective heat – in other words hot air. Radiant burners also produce radiant light energy. This energy transfer occurs without a change in air temperature, making it feel much like warmth from the sun on a cold winter day. Although convection is responsible for the majority of the Reactor’s heat output, radiant energy plays a significant role in the stove’s performance. The biggest performance advantage comes from the control and management of airflow. 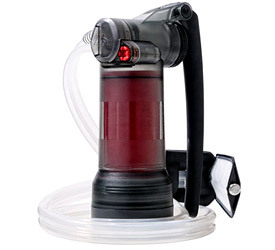 The Reactor’s burner operates on 100% primary air, pulling all the air it needs through ports on either side of the flame control knob. All air and fuel mixing occurs inside the stove, allowing the flame to be completely enclosed and protected from wind with the integrated heat exchanger. This construction makes the Reactor’s radiant burner far more resistant to wind than a conventional burner. Combined with the broad, evenly dispersed flame, it also makes the Reactor difficult to blow out, even when the pot is removed. The Reactor is the only radiant burner stove on the outdoor market and it is the only outdoor stove in the world that runs on 100% primary air. This unique technology gives the Reactor a real advantage in weather resistance, power and efficiency.